Yes, I have 2 blogs which keeps me very busy and I love it! Let me back up a little and tell you more about myself. I started a blog back in February....my 1 year Blogiversary is right around the corner!! I can't believe it. I have 10 years of teaching elementary school and loved every minute. Yes...there were challenges but that's what made it interesting...every day! Now I'm a stay at home mom, creating teaching resources, clip art, and teaching my kiddos. I have a boy (almost 5 years) and a little girl (2 years old). I'm not a homeschool mom but I might as well be with the amount of work I make them do..haha! So I wanted to share this cute cutting center idea for your little ones. 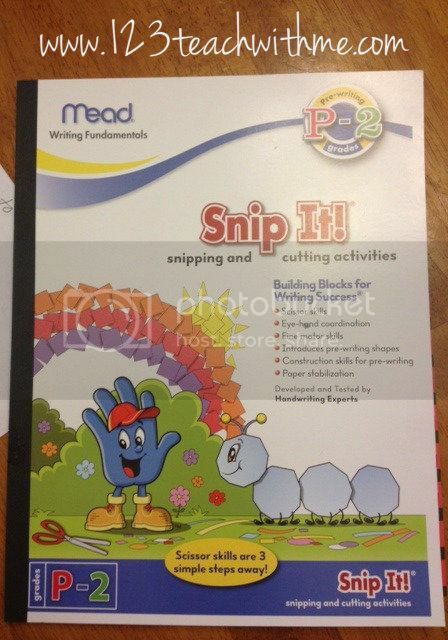 I found this activity book in Target (gotta LOVE that place) and thought it would be great for my little boy to practice his cutting skills. That was one of his goals over the summer.....to become a better "cutter" and he is definitely getting better!!! Through much frustration on my end, and a lot of "I don't want to!" on his end, we have battled through it and he is cutting better than some of my first graders did in those first few weeks of school. 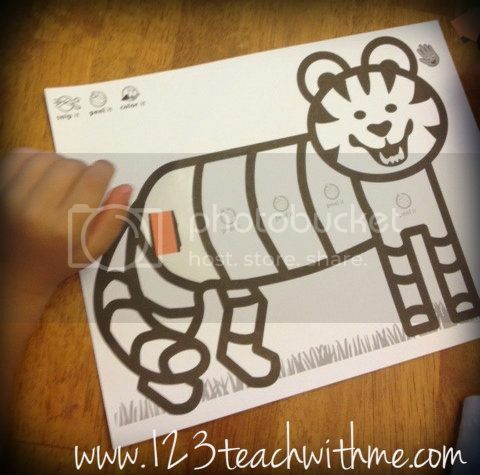 This activity book has made it so much more fun! 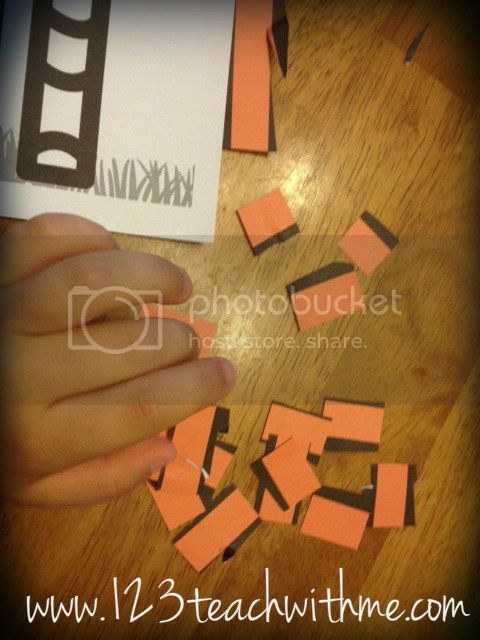 There are pictures inlcuded that peal in certain areas, so when your child cuts the strips of paper in the back, they lay pieces on the sticky part and it becomes the cutest little picture. Here's what we did! My son wanted to do the Tiger. 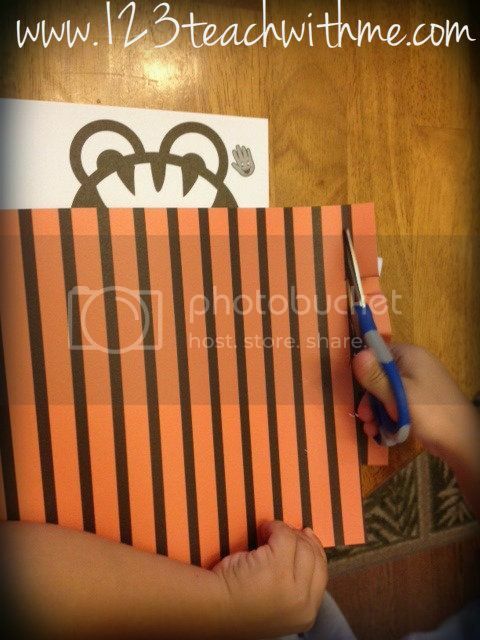 We picked out the orange paper in the back that already has thick lines for your child to cut on!! AWESOME!! You don't need all of the pieces. He cut 4 out and then cut them into little pieces. Then he pealed off the part of the picture that say "peal it"
He then placed his orange pieces on the sticky part and created his picture. 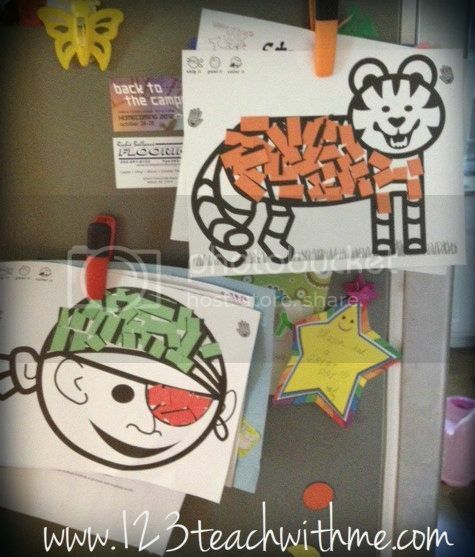 This is such a cute project that makes great "Frig Art"!!! Here is the pirate he made!! for everyone...no mess to clean up!!! 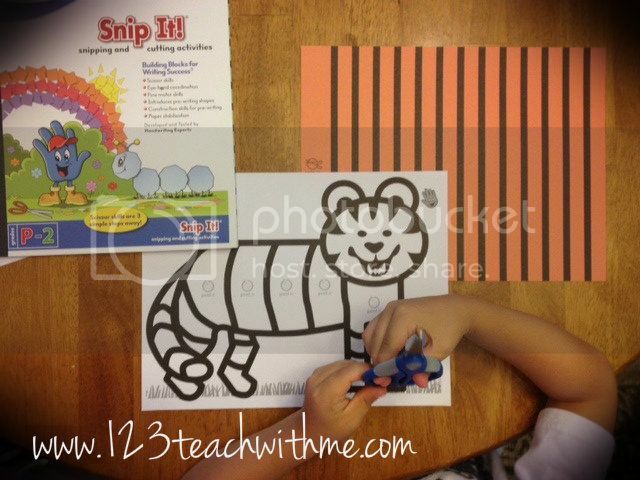 It just focuses on the cutting skills and it definitely gets those fine motor skills a good workout! Here is the link to the activity book on amazon if you want to check it out! I want to thank Mo for having me over today!! I have really enjoyed it and I hope you'll stop by my blogs sometime!!! Head on over to Primary Possibilities!!! 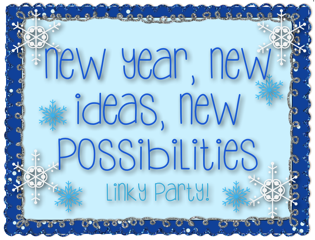 There's a lot of blog hoppin' to do!! Thank you Tammy for guest blogging on More Than Math by Mo today! Be sure to head over to where I am guest blogging today. Click on the picture below to hop over and check it out. As Tammy stated previously, "There's a lot of bog hoppin' to do!!" My kids this year are struggling with cutting too! I will have to check this out the next time I am in Target. I ordered a few from Walmart.com this morning. They are just under $ 5. I can't wait until they arrive-I'm so excited.